Situated about 40 km from Villa La Bianca you can find Borgo a Mozzano, a small hamlet in the Serchio Valley, 20 km from Lucca. The hamlet was first mentioned in documents dating 879. In this small town one can see Monte Bargiglio, (one of the secondary peaks of the Apuan Alps) and at the top of this there are the remains of an ancient watchtower called the “eye of Lucca”. Borgo a Mozzano’s territory is filled with typical medieval fortifications that today still conserve the characteristic traits of their original construction. 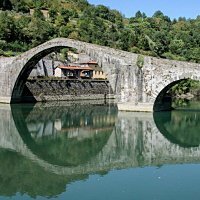 Borgo a Mozzano is dominated by the presence of a medieval bridge called Ponte della Maddalena also known as "del Diavolo" (Devil's Bridge). The bridge crosses the Serchio River and is a symbol of the Valley. The name “Devil’s Bridge” refers to local legend that the builders were helped by the Devil in the completion of the bridge. As you walk along the main streets of the town, there are 3 churches of note: the Chiesa di S.Rocco, whose current appearance is the result of a series of reconstructions and extensions of the original oratory founded in 1525; the Chiesa di San Jacopo, where it is possible to admire exquisite wood carvings and sculptures dating back to the 15th & 16th Centuries; and the Chiesa del Santissimo Crocifisso, where a 16th Century image of Christ crucified is thought to have saved much of the population during the plague of 1630. Also worth a mention is the Convent of Saint Francis with it’s beautiful baroque church and elegant 16th Century cloister, and Palazzo Vicario, a renaissance building that is today home to the Town Hall. The town also hosts events such as the Feast of the Azalea in April, where the town is decorated and comes alive with the colours of this beautiful spring flower; and Halloween, inspired by mysterious legends that surround Lucca and the Garfagnana area.